TrueScale’s Blog » Post Topic » Question: Can you add anything to the Cox GT40MkII Prototype thread at SF? What do you think of the last “prototype MKII to showup at Slotforum? The white one with Chrome headlamps? That was clearly a fraudulent item. I know all the details about it. Most of us would agree that the paint was still wet on that one. It was a piss poor attempt! Not even close and poor workmanship. A rush job if you will. There are alot more pictures of it published on the web to see. 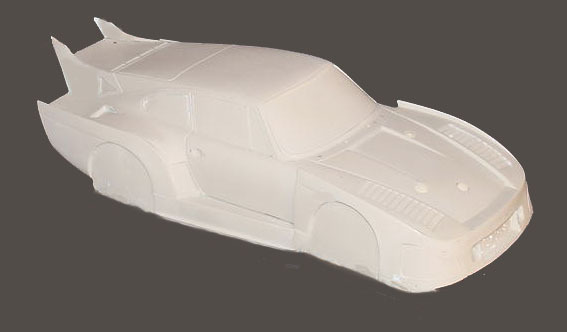 I would also like to add that if someone was given “All” the “Cox GT40 MKII prototypes” back in 1977 directly from Cox (as declared on Slot Forum) why would they make more or obtain/purchase other supposed “1/24 CoxGT40 MKII prototypes.”?